Just came from Sg Buloh Hospital. The Biopsy Report came out already. Mamarazzi's swollen Lymph Nodes was due to infection. Not Cancerous or anything. Thank God for that. To celebrate, we headed to Amcorp Mall to eat Mamarazzi's favourite Prawn Noodles. At Uncle Snack, 3rd Floor, Amcorp Mall we ordered big bowl of Prawn Noodle for Mamarazzi. Papa had Seafood Rice(Top right pic). Papa said it's not bad. I had Ginger Beef Rice. Hmm...I makan the rice with gravy only. Didn't get to makan the beef. Papa and Mamarazzi walloped the beef. A bit tough. Maybe it's imported beef kot coz Raya coming. Local beef all habis gua. I was impatient to get on with "Xcess"
Mamarazzi borong-ed a lot till I get to "dip-dip" their Lucky Draw twice. First round Mamarazzi dipped. Fished out this great 20% discount Book Voucher in a Hari Raya Packet. A very good idea. Festive. Mamarazzi used the voucher to get me this "Tiki" Mouse Clubhouse book". LOve the illustration. Later when we were in the car, Mamarazzi regretted. Said should have used that voucher to buy "The Completely Mad" by Don Martin which was going for RM99-90. Mamarazzi was very attracted by the collection and Papa too. The 2nd round "dip-dip" was by me. I "dip" out two "green packets". But the Mamarazzi said I can only choose one. Gave one to the Jie Jie at the counter. Wa...it's a book. I won a book title The Lady Who Was Beautiful Inside. Hmm..I wonder whether she is as beautiful as my dear or not. No...you can't hold it. I am keeping this book. It's mine. Here is Mamarazzi's hoard. 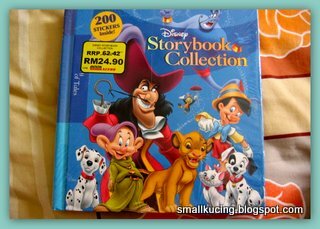 All are RM9-90 books, except for the "horsey" book. The Horsey book was RM3. Beh tahan..Mamarazzi bought another one of Nicholas Sparks book though the "Dear John" book was not that good. Two more Asian writers books. Hope they are good. Mamarazzi just finished reading "Six Suspects" by Vikas Swarup. Very good book. Mamarazzi was in Seventh Heaven when she saw that BookXcess have "Slumdog Millionaire" in their stock. Grabbed. Another hardcover story book for me. This one even comes with 200 pieces of stickers! Last but not least. My "dip". Here is the beautiful book. Hardcover. Inspirational book for people who feel inferior about their look. wow, so many books to choose from. Thank god just and infections and nothing serious! Wah more books again! ah, i can imagine your worries then. You going to BX this week? Eh...get the Mickeymouse book and the Disney Story collection. Worth buying la. The illustration very nice and then got many stories inside. Choy!!! not gua? 50% off? Mamarazzi will jump from KL tower LOL. Just scared next week they announce BBWS saja. Aiyo...prev two BBWS really teruk oh...All across the board average price RM8 per book. Crazy la. It's worth going even when it's without sale. Average price are RM17-90 to 19-90 for famous or well know authors. Then there are a lot of books that priced RM9-90. Some of famous names while others unknown authors. Since it's RM9-90, it's worth experimenting for new author. At least read a variety. Kathy u really are a book lover! At 1st was worried it might be cancerous after what the Private Hospital Surgeon had said. Maybe that surgeon was looking for a fast bucks. Ya lo...suddenly so many swollen nodes pop out. Went to GP, the GP also got a shock. Went to Private Hospital, also kena frighten. Then to Government hospital, the doctors also surprise. Coz normal are only 1 or 2 nodes swollen. Not whole bunch like grapes. that book should be very suitable for ladies who dont feel happy.. not suitable for small kucing.. u r always happy!! LOL...thats why Mamarazzi not going to KLCC BookFest. Book Fest get around 20% to 30% discount off the original book price. Thank god your biopsy came out ok! ps: Mamarazzi celebrate raya ah? got rumah terbuka anot? Auntie mau makan ketupat! LOL. Haizzz... there's a saying ah, smallkucing... doctors saves you from pain... just so that they could kill you with the bills. Lucky your mamarazzi clever, tarak let people sembelih. LOL. Hey, we ordered the same prawn mee and seafood rice (and Cantonese fried noodle) at Uncle Snack's 2 weekends ago too. What a coincidence! The prawn mee was good but very small portion only... not enough hehe. Portion small? Hmm...it was just nice for Mamarazzi LOL. Hey..really glad to hear it was just an infection! But infection can cause such a roller ride. As long as it is not the big-C! Salute u la, Mamarazzi! U really love books!!! Must have a REALLY big bookshelve to store all ur collection!